The revolutionary digital S550 will change the way you do your ironing. Imagine pressing your clothes without all the work! The pressing surface on the S 550 is over 10 times larger than the pressing surface of an iron. Pressing with the S550 can reduce ironing time by up to 70%. Extra large 450ml water capacity. Easy to use contoured handle. 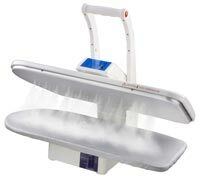 Powerful 1350W heating element.34"x11" it is like a press shop in your laundry room. For dressmakers, you can even use the S550 as a mini-fusing press. Its even heat and quick burst of steam is great for setting fusing on collars cuffs, jacket fronts etc. Standard features include a powerful burst setting for stubborn wrinkles, digital temperature control, safety alarm with auto shut-off, and of course, Reliable's trusted reputation for building quality, long lasting equipment.